For with You is the source of life. By Your light we shall see light. The first candles are lit tomorrow! In preparation for Hannukah, I have gathered some menorahs and our home one is not even out yet, as these are taking up all the room, they are waiting in preparation! Tomorrow is the first night of Hannukah. This year I wanted to have a menorah for every occasion and window in my life! this year there is the one that I will light in a place yet to be determined, or I might just carry it around! It runs on batteries so I can decide later!! I have few ideas! Hannukah is a festival where we can and are invited to take our light out into the world. It is exactly the message of Yeshua and the gospel, to be the light in the world!! It is a wonderful festival of miracles and Light. Hannukah is thought to be considered one of the "minor" festivals of the Hebrew calendar. But I think that like the tiny vial of oil that became a miracle lasting eight nights, enough for the Jewish people to re-dedicate the temple to ADONAI, there is a lot more to be revealed about Hannukah! The victory of the Maccabees and the victory we see in another "minor" Hebrew feast of Purim, were both amazing testimonies of the Jewish people that they would never bow down to other gods and assimilate into worldly ways, The story of Esther and the story of Judah Macabbee are victories for God's people and of being a light in the world by walking in God's ways. I think in the same way that the little vial of oil went a long way, there is a lot more that will be revealed about Hannukah in the days of increasing light! and your healing will spring up speedily. the glory of ADONAI as your rear guard. The middle candle on the menorah that is used to light all the others is called the Shamash. This light represents the light of Messiah Yeshua who is the Light by which we are to be the light. We first light the Shamash, which means attendant or servant, and use it to light the candles in each night. As I was making the 9 candles for my paper clay menorah, somehow I realized the Hebrew letters of the word "shamash" also looks like a menorah with 7 lights!! The menorah that constantly stayed lit in the Holy of Holies and in the Holy Temple has 7 lights. The Hannukiah, or menorah we use at Hannukah has eight to represent the miracle of the oil burning eight nights. Doesn't the word itself look like the menorah?! The two "shins" with the "mem" in the middle. And there are 7 "flames" on the tips of the letters!! We see the shamash as representing Messiah Yeshua and his light which lights all the other candles. From His light we are to be light. like calves from the stall. The first night of Hannukah is tomorrow, December 2nd at sundown. Hannukah lasts for eight nights. For those who are feeling in their spirit to observe Hannukah, even if you never have, this could be a great year to start!! which is beautifully put together to include everything from making your own Hannukah Menorah (called a Hannukiah), to songs and recipes and stories for all eight nights!! Hope you might head over to His Israel, while there is still a day before the start of Hannukah! The link is HERE, and posted on the sidebar for your reference. 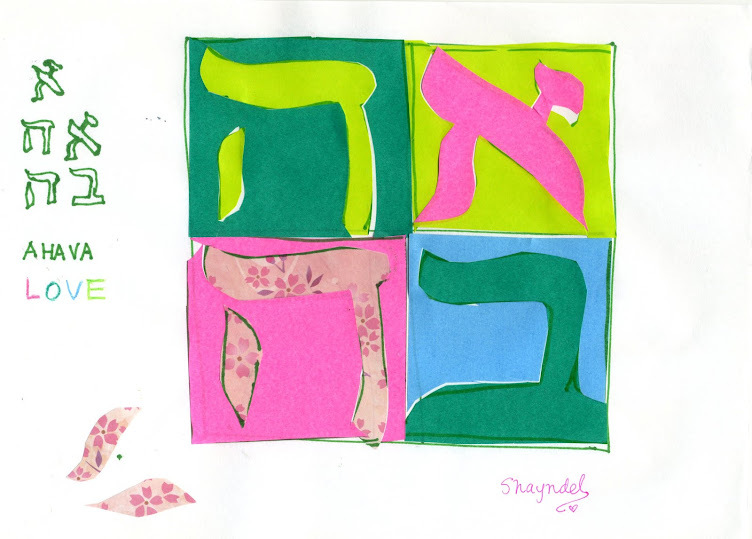 Please also see on Aritha's blog she has blessed us with a post about Hannukah from One for Israel, which can be found on Aritha's blog HERE. 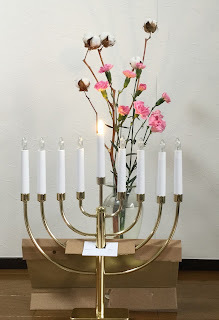 About the electric menorah---this is something I have always wanted since I came back to observing the Hannukah feast about 3 years ago in Japan. I am from Long Island and a fond remembrance is going to visit my Grandfather and in the lobby in the apartment building where he moved in his later years, there was always an Electric Menorah shining the lights of Hannukah!! In many apartment and office buildings in Long Island and New York it is common to see an electric Menorah welcoming in the lobby!! So this one really makes me feel at home! Actuallyit is battery operated, which is even better!! Its still not completely unwrapped, but I tested it and you can see the "shamash" is lit!! I am not sure where it will go, as I have been making the paper clay one for our lobby in the apartment...will see! Meanwhile it is almost Hannukah! From the rising of the sun to the going down of the same, the name of the LORD is to be praised. The electric version makes a lot of sense. When I have celebrated the candles burn down and make a mess, so I only leave it lit for a short time. Thanks Sandi, glad you like the idea!! For the candles, there are things you can do like trim the wicks or put foil in the bottom so they burn down smoothly. Your explanations are concise and especially clear! It's nice that you put a menorah in different parts including the lobby of the building.